The In-Depth Retreats are five day intensive guided workshops at my private studio in Scottsdale Arizona. Scheduled January through April, these annual retreats are a unique opportunity for personal and artistic development through an intimate group experience in a creative professional environment. The retreat includes gourmet lunch and dinner prepared daily on premises by a classically trained culinary professional, Praparat Sturlin of Thai Gourmet House Cooking School. Seating is limited to four participants per retreat. The In Depth Retreat experience focuses on continuing skill development for jewelry makers and designers. This creative session is a self guided laboratory for individual exploration and refinement of design, technique and aesthetic development. I serve as technical adviser, team leader, personal coach, guide and mentor. Students have an opportunity to work in 18 karat gold under their own direction with my technical supervision and my insight and advice on their individual projects and design concepts. Emphasis is placed on the traditional professional approach to our craft; alloying metals, melting and amalgamating gold, pouring ingots, forming sheet, wire, and tube, and focusing on hand fabrication and construction with noble metals. This is an opportunity to develop confidence, proper technique and material fluency under the watchful eye of a master goldsmith. Alongside applied techniques of goldsmithing I teach a process of design origination and refinement intended to create jewelry with strong cohesive content, which accelerates artistic maturity. I help each participant identify the underlying characteristics and essence of new work they want to explore or existing work they want to take further. I show how to assess design and ideas with objectivity that enables focusing in on the strongest characteristic and developing the most promising features in a logical and efficient way. As each participant develops their design portfolio I offer guidance on the various tool and technique options to create their body of work. My goal is for retreat participants to depart my studio with well-developed original design concept(s) accompanied by solid plans for executable series of jewelry. This planning and preparation includes evaluating the time and resources it will take to create the work, assuring the momentum of the experience here can carry forward on a solid foundation. Demos of applied technique during each retreat vary depending upon the individual interests of the participants and the collective dynamic of the group. 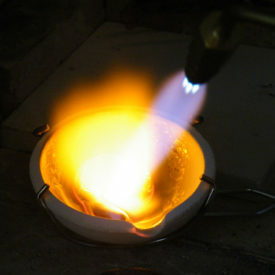 The studio is furnished with jewelry benches, flex shafts, propane/oxygen Meco torches, acetylene atmospheric torch, melting crucibles, ingot molds, rolling mill, draw bench, draw plates, engraving balls, forming blocks, bezel blocks, bezel and bracelet mandrels, pitch bowls, chasing tools, sand bags, silversmithing stakes and forming hammers. Just saw this message today. I sent an email with the registration form to you and Paula. Please let me know if the dates for Session D, March 9-13, 2020 will work for both of you. You can confirm your enrollment by sending the deposit.